Betsi Bixby is reported to be one of the people cyberstalking and defaming William M. Windsor. Betsi Bixby is reported to be a Joey. The Joeys are a group of people who have viciously cyberstalked Bill Windsor. Here's what her website says about her: "Betsi Bixby had the concept for Freedom Horses in her heart for months before this program took shape. As a volunteer ladies bible study leader at her church since 2001, she's witnessed the devastating effect of abuse, sometimes many decades past the actual events. 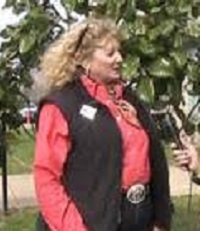 She has a passion for horses as well as helping women. Betsi has been a business owner since 1991 and a former banker prior to founding her company Meridian Associates. She moved to her small ranch in Weatherford, TX in 2000. She is praying that Freedom Horses will stretch first across America and eventually across the globe to bring hope and healing; courage, compassion and confidence to survivors; and inspire prevention that eventually impacts the source." Ann Pitts, Mary Lou Curry, Sandra E. Galonska, Selma Johnson, Tammy Sronce, and Robin Bowser all work with Betsi Bixby. If Betsi Bixby is one of the people who has lied her a$$ off, defaming me in a wide variety of ways, she is one of the bigger hypocrites in America. I believe Betsi Bixby has posted under an anonymous name on the Joeyisalittlekid website. I sure wouldn't want her leading bible study at any church I attend. I gave Betsi Bixby the opportunity to sign a sworn affidavit stating under oath that she was not a Joey. She did not respond. I am now sending affidavits to Ann Pitts, Mary Lou Curry, Sandra E. Galonska, Selma Johnson, Tammy Sronce, and Robin Bowser. I believe Betsi Bixby is "NothingBetterToDoToday" on the Joeyisalittlekid website. This person has published an astonishing 3,054 comments between November 2012 and the end of March 2014. Here is a chart of what Betsi Bixby has published. NothingBetterToDoToday has lied about me repeatedly. She has defamed me repeatedly. She may be a drinker because her wild and defamatory comments get wilder and crazier later at night. I do not like having to attach a chart showing all of her defamation and conspiracy efforts with the other Joeys, but it's the only tiny way I can attempt to set the record straight. I have sued Betsi Bixby, and I have named all of the Joeys as defendants. Among the things that I believe Betsi Bixby has published about me is this: "Bill Windsor conned some women ane few men out of money...." This is false and defamatory. Conning is a criminal offense, so she has falsely accsued me of a criminal offense. That makes her defamation easily proved. As a member of the Joeyisalittlekid conspiracy group, I believe Texas law will find that Betsi Bixby is liable for the full amount that the jury awards me for the defamation by her and all of her anonymous and semi-anonymous online friends. I hope that will be way North of $100 million in punitive damages. If Betsi Bixby is not one of the Joeys, all she needs to do is sign a sworn affidavit so stating. Absent that, I guess I could become the proud owner of FreedomHorses. Maybe I will own her financial company, too -- Betsi Bixby of Meridian Associates, Inc.
"A professional financial sharp shooter, Betsi Bixby is well known for the valuable knowledge and experience she brings to petroleum consulting. With an MBA in Corporate Finance and experience as a Former VP of Commercial Lending at a major regional bank, Betsi Bixby has been applying her extensive financial knowledge and experience to the petroleum industry for the better part of two decades. "Betsi Bixby clarifies and simplifies complicated subjects into concrete step-by-step processes that dramatically impact company performance and profits. Through her quarterly Money Matters column published by the Petroleum Marketers Association of America (PMAA), and her PetroAnswers.com website, Betsi Bixby has become the most widely read expert in the Petroleum industry over the past two decades. She is also a member of the National Petroleum News (NPN) and SIGMA IGM Editorial Advisory Boards. "Each year since 1992, hundreds of petroleum marketers have attended Betsi Bixby's hard-hitting workshop, now dubbed "The Best Workshop in the Industry." Betsi Bixby is familiar with most major refiners, conducting regular annual training sessions for the industry’s biggest brands. In addition, Betsi Bixby formerly ran a financial study group for Exxon’s lubricants master jobbers prior to their merger with Mobil. Betsi Bixby captivates convention audiences throughout the U.S. with her "20 Ways to Increase Cash Flow" and other hard-hitting, practical programs with take-away audience value. Betsi Bixby's most requested recent topic is "Growth through Acquisitions,” a seminar that focuses on common merger and acquisition pitfalls. "In response to customer demand, Betsi Bixby began Meridian's highly successful Valuation and Brokerage division in late 1999. Betsi Bixby and Meridian quickly earned a reputation for accurate valuations and have continued to achieve great success, facilitating highly confidential sales of family-owned petroleum companies. "With Christ-centered personal ethics, Betsi Bixby strives to be a blessing to her customers, her employees and the industry she loves. Betsi Bixby currently resides in Weatherford, Texas where she enjoys a ranching lifestyle. In 2011, Betsi Bixby founded Freedom Horses, a non-profit organization that links survivors of domestic violence with volunteer horse owners to rebuild courage, compassion and confidence. For more information go to www.freedomhorses.org. "Betsi Bixby is former Chairman of the Tucson YMCA, former President of Greater Tucson Leadership, and former President of Soroptimist International of Tucson. Betsi Bixby’s greatest accomplishment, though, is Sheila Janan, her one and only child. Sheila Janan completed her Masters degree and is nationally certified in behavioral health counseling." If Betsi Bixby is NothingBetterToDoToday, she is one of the bigger liars in America when she claims she has Christ-centered personal ethics. NothingBetterToDoToday seems to be a devil to me. I wonder if I will need to name Betsi Bixby's daughter as a defendant. I'll need to depose Sheila Janan and people with these various organizations. Betsi Bixby seems to also be Betsi Lueth and Betsi Flores. Her known list of aliases are: Betsi Bixby, Betsi Lueth, Betsi Betsi Lueth, M B Lueth, Besti Flores, M Betsi Lueth, M Betsi Flores, Mary Betsi Lueth, B Bixby, M B Flores, Betsi M Bixby, Betsi M Lueth, Bet M Bixby, M Betsi Bixby, Betsi M Flores, Betsi M Lueth, Mary B Lueth, Mary B Flores, M B Lueth. And, of course, BothingBetterToDoToday. Why does Betsi Bixby use so many aliases? Other associates are believed to include Nick Bixby, Marilyn E Massey, Ronda J Johnson, Sharon Fields, Vonda M Juarez, Alyce M R Steadman, David P Lueth, Jose Y J Flores, Erin M Flores, J Warren Lueth, Lois Adelle Lueth, Robert C Lueth, Nicholas S Fields, Sharon Ann Bixby, Catherine Ann Wigger, Marie Elaine Morgan, William L Wigger, Lena E Wigger, Cathy Wigger, Cristina Flores, Omayra Flores, Aracelis Flores, Joe Flores, Cristina Flores, Sheila Janan, Sheila Bixby, Sheila Lueth, Sheila Flores, Morgan Earle, Abbey Earle, jean Earle, Andy Isaacs, Sharon Hopkins. I wonder how many of them will prove to be Joeys. Depositions will be held in Weatherford Texas, Tioga Texas, Howe Texas, Scottsdale Arizona, Phoenix Arizona, Simsbury Connecticut, Hartford Connecticut, Paradise Valley Arizona, Everett Washington, Tucson Arizona, Yulee Florida, Fernandina Beach Florida, Saranac Lake New York, and Lake Placid New York. I have thus far been unable to get a Texas court to enjoin these folks and force them to take down all the defamatory material. Until that is done, I feel I ave no choice but to deny all the defamation here.